Open Maps from the Home screen. The keyboard opens and a list of your recent searches appears. If you seek a recently searched for address, tap it in the list. An address in the form of a street name and number or an intersection, with the city and state or just the name of a city or town. The name of a person or business that’s stored in your Contacts. A list of potential matches from Contacts and the Maps database appears; if you see the address you seek in the list, tap it to open a map showing that location. Tap the blue Search button in the bottom right corner of the keyboard. A red pin on the map indicates the address you seek. The address is written on a flag attached to the pin. If the location is near your current location, you also see the travel time under the driving button. If you want to keep the found address for future use, tap the right end of the flag, and then tap Add Bookmark, to store the address in Maps or tap Create New Contact or Add to Existing Contact to store the address and associated information in Contacts. Tap the Bookmarks button to the right of the Search field. Tap the Bookmarks button at the bottom left of the screen to use a bookmarked location. A list of bookmarks opens. Tap the Recents button at the bottom in the center of the screen to use an address you’ve recently accessed. A list of recently used addresses opens. Tap the Contacts button at the bottom right of the screen to choose a person or business from Contacts. Your All Contacts list appears. Scroll through the list to open the Info screen that contains the address you seek. Tap the address you wish to use. 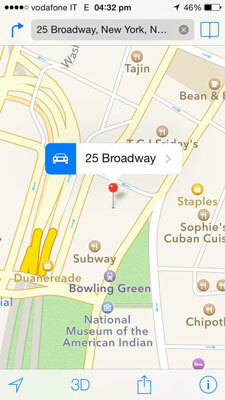 A map opens and a red pin indicates the address or location you’re looking for. If you want a clean slate, you can clear your bookmarks by opening the list and tapping Edit, and then tap the red and white minus sign followed by the delete button, or simply swipe across the bookmarked address and tap Delete. Although bookmarks can be removed singly, removing recent locations is an all or nothing deal: Tap Recents and then tap the Clear button and the list is emptied. If you want to save a Recents address, open it, and then save it as a bookmark or an addition to Contacts.